On a warm afternoon in Williamsburg, Brooklyn fans of both hip hop and reggae came together to celebrate a rare pairing. One half Brooklyn born, Queens raised street rap, the other half Jamaica bred, reggae royalty. 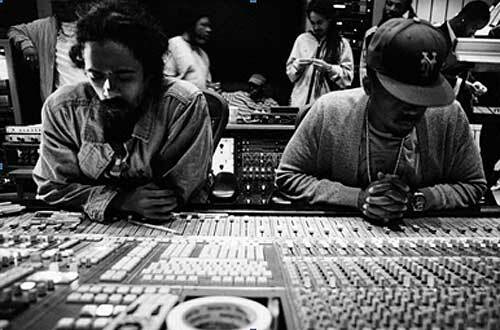 On paper the pairing of Nas and Damian Marley seems too big to work. Both have huge fan bases and are very successful on their own. Also we have all seen what can happen when two genres try to do a full project together. (Best of Both Worlds anyone?) So it’s easy to give a side eye to this project. However these guys prove their disbelievers wrong and gave fans of both genres a reason to party together. The line for entry (which started around 3:00) stretched three city blocks in anticipation. Ticket holding fans mixed in with a number of hopefuls looking for anyone willing to sell an extra ticket, were excited to sing along, dance and…maybe smoke some weed. Let’s be real here, this is at least a half reggae concert, and therefore weed should be expected like wool scarves being worn in the summer (this is Williamsburg still). The weed part of the evening was in a word interesting due to the large amount of Homeland Security officers ejecting random folks found smoking the modern burning bush. Who would have thought Babylon rules would be enforced at a concert with a Marley on the bill. I suppose this is the new New York. Yet, when early on lighters were tossed from the stage into the audience, it’s hard to make sense of the whole thing. Unfortunately random arrests weren’t the only thing this audience had to worry about. The show itself took 3 hours to get started. About two hours were filled with DJ sets by Hot 97 personalities Bobby Konders, Jabba and Peter Rosenburg. The audience ate up the old reggae tunes as well as the hard-hitting rap tracks played by both groups (except the swag rap segment which was met with boos and thumbs down literally). As the sun began to set and the band took the stage you could feel the energy rise in the venue. Once the music for the opening for the track “As We Enter” started, Damian walked out to huge cheers making way for Nas to join him. The two of them destroyed their set, flowing back and forth as if they’ve been performing together for years. After doing a few songs from the Distant Relatives album, Damian retired to allow Nas time to commune with his fellow New Yorkers. During this set fans were treated to songs like “Represent” and “If I Ruled The World”. Amazingly, Nas remembered all the lyrics to his songs. This is a rare occurrence. The Distant Relatives album is perfect for a sold out show like this. Songs like “Dispear”, “Nah Mean” and “Strong Will Continue” keep the crowd on their toes pumping their fists and shouting along with immense feeling. For a moment Nas lets his guard down after rapping about his ex wife’s possible infidelity during their marriage. He says he’s been “going through it” and the fans on this night feel him. Damian’s solo set while longer than Nas’ was equally enjoyable. This was especially evident when he performed his father’s legendary song Exodus. You could feel history being made right before your eyes. The two performers finished off this intense show with a range of emotions from songs like “Count Your Blessings” to the beautiful “Africa Must Wake Up”. The audience fell completely under their spell following Nas and Damian’s every word from raising lighters to fist pumping and none of it felt forced or contrived. There was a true moment being had both on stage and in the audience. By the hugs and handshakes given throughout the crowd at the end of the show, it seemed that more Distant Relatives were found that night in Brooklyn. Previous Post Music Monday - George Duke + Trek Life, KRS-One, Snoop & more..